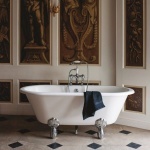 ​Clearwater Classic Baths a true vintage look in your bathroom, covering every size and installation requirements. There are roll top baths with a choice of feet with various styles and colours, so you can tailor your bath to your own individual tastes and to work seamlessly with your own décor and Clearwater bathroom surroundings. These baths come with a free 10 year guarantee.